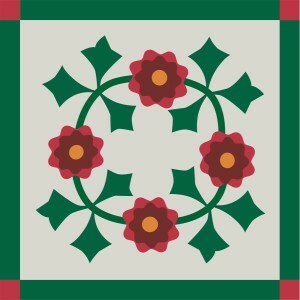 A quilt trail is a driving route along which property owners have voluntarily decorated their businesses, barns, outbuildings or residences with painted wooden quilt blocks viewable from the road. The property owner selects or designs a colorful pattern, often revealing historical and personal connections to the land, business or family. The JBQT driving route puts Julian in the center of an imaginary pinwheel, extending out on well-traveled roads through communities about 30 miles in any direction. In our inaugural year, 2014, 13 blocks were installed and our second year was equally busy. We now have blocks located in Julian business windows and on stores, restaurants, barns and business buildings along the highways. Five neighborhood blocks adorn private properties off the trail, tucked away in residential areas. The Julian Backcountry Quilt Trail is a visible source of pride for the Julian Woman’s Club. This endeavor is a project that honors the great American art form of quilting, benefits the businesses in Julian, and entertains travelers as they tour the backcountry roads of San Diego County.